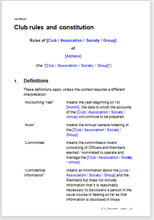 This is the perfect constitution for your club, association or society. It covers all your basic requirements very thoroughly. It sets out the constitution and rules in a sensible, practical way with notes of advice too. Needs no legal expert support and no registration. Just go with it. This is a constitution or set of rules to regulate your management of any straight forward club, society, association or other organisation that is not a registered company. You can use it to manage a charity - remember to register it with the Charities Services. If your organisation will make a profit, that money will of course be subject to tax. Not suitable if your organisation is incorporated (under the Charitable Trusts Act 1957, Incorporated Societies Act 1908 or Companies Act 1993). Whether your club is new or has existed for years, you have a simple choice of how to structure it. You can either go for a corporate structure, regulated by the Companies Act 1993 or the Incorporated Societies Act 1908. Use this document to create a management framework which is not regulated in law. There are no constraints nor publicity. You can edit to create exactly the structure you want.